The Superior Small Lodging Association is smiling bright this week. The group just notched impressive results in its annual quality-assurance audit. Find out which properties got the”White Glove” treatment. In all, 33 of the 37 Superior Small Lodgings received the Donal A. Dermody White Glove Award, recognizing their outstanding performance in housekeeping. The evaluation was performed by the Property Review Program, an independent on-site inspection service. All 37 passed the audit. The Superior Small Lodging distinction is for properties with 50 rooms or less and has properties in almost every community in St. Pete/Clearwater. If you opened a recent email from Groupon Getaways, you would have seen a local hotel on St. Pete Beach offering amazing deals: Postcard Inn on the Beach was in the process of selling almost 800 rooms at just $89 per night. And the deal included welcome drinks, too. All-in-all, it was a 45% off of PCIs regular rate. So, with hundreds of Groupons sold, CVBeat sat down with PCI’s Director of Sales and Marketing, Bob Sauerwine, to find out if this new marketing and sales trend was actually beneficial for his property. CVBeat: Is Groupon a better way to reach customers than traditional marketing? Sauerwine: I would not say it’s better, but it is different. It has an immediate response unlike traditional print ad, banner ads, etc. And it’s very trackable, whereas some banner ads or print ads are sometimes difficult even with tracking steps in place. It is also a way to fill low-demand periods in a very short period of time. CVBeat: Considering your Groupon was a 45% discount on your room rate, was this good for business? Sauerwine: Yes. It fills need dates and can be catered to your business’s needs. Also, people buy the coupons but may never use them, which is called “breakage.” When this happens it makes the marketing campaign more profitable, since it shrinks the percentage of those who actually redeem the coupon. CVBeat: Almost 800 people bought your Groupon. Was this more than you expected? Sauerwine: This was our first experiment with Groupon and it was a huge success. Groupon also was so impressed with the results that they extended the offer. CVBeat: What are some problems associated with offering internet coupons? Sauerwine: We are so new into the program that we really don’t see any real big problems—other than having adequate staff to answer the phone, but that’s a great problem to have. CVBeat: There are alternatives to using Groupons, like Living Social and Facebook deals. Are you using any other sites to reach customers? Sauerwine: Yes. We actively use social media to create a following for all of our special events. We also use email blasts of our database of emails to promote the property, specials in the restaurant, special events and room night offers. We have done Living Social and are looking into ZOZI, too. See how VSPC’s highly-targeted arts and culture campaign builds upon our “America’s Best Beaches” message, growing the area’s brand by touting the treasures beyond the beach. The print ads featured snapshot visuals from some of St. Pete/Clearwater’s most prominent museums, attractions and performing arts centers, such as The Dali, Clearwater Marine Aquarium and Ruth Eckerd Hall. 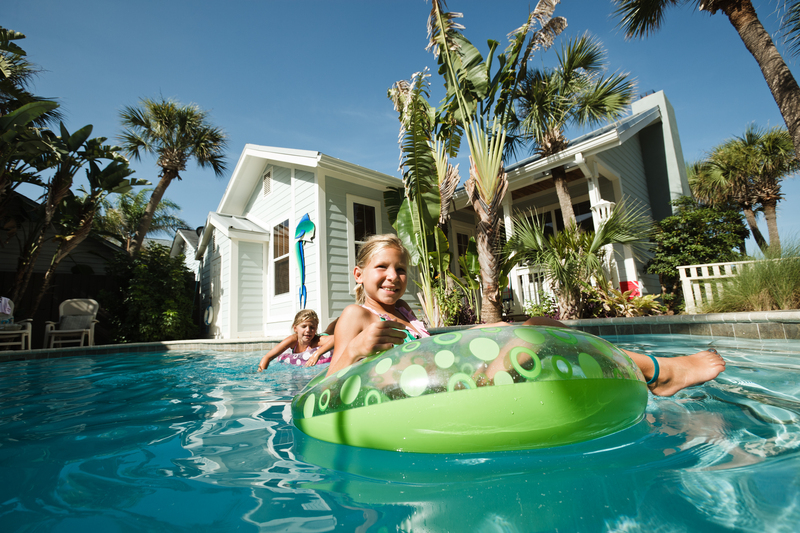 Beach and culture maps, which are distributed at trade-shows throughout the world, local conferences, sporting events, Visit Florida welcome centers, AAA offices and hotel/attraction brochure racks. The Articulate website, which highlights the must-see events in arts with corresponding advice from expert bloggers who recommend what events to mark on their calendars. Emeril’s Florida, starring celebrity chef Emeril Lagasse, which highlighted several arts attractions, while showcasing St. Pete/Clearwater as a culinary destination. For a complete rundown of the campaign, click here. Beat the crowds to the Dali: Director Hank Hine sneak-previews a rare Dali work from a private collection that museum officials have yet to unveil. Check it out in this CVBeat exclusive. CVBeat: Tell us about the highly-coveted piece of artwork your museum got its hands on. Dali Museum Director Hank Hine: We are going to be presenting this summer an amazing painting by (Salvador) Dali. It’s called “Santiago El Grande” and it’s grand in two ways. First of all, Santiago as the patron saint of Spain was very great, very important to the Spanish people. He liberated the nation of Spain from the Moors. It’s also grand in real dimension. This painting is 13 feet tall—it’s one of Dali’ largest. CVBeat: How were you able to pull this off with so many museums in the world vying for Dali’s works? Hank Hine: The Dali in St. Petersburg is that important. Museums are kind of a network, like a family of institutions. And the more prominent they are to that member of the family, the more they do for the public, the more resources they have, the more they can borrow and receive. We negotiated to borrow it from a Canadian institution that owns a private collection. CVBeat: So, on a worldwide level, Dali is a very sought after artist for special exhibits. Give us an example of the impact Dali’s artwork does for a museum. Hank Hine: As a matter of fact we just loaned 14 paintings to Paris to an exhibition that received 890,000 people in a period of three months. So 10,000 people a day were seeing this show. CVBeat: How large is this painting compared to the others Dali created? 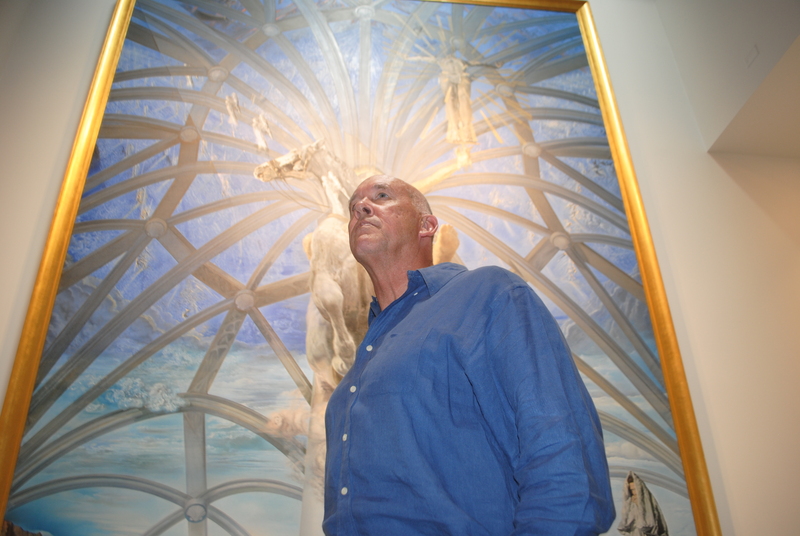 Hank Hine: This is the second largest painting that Dali ever made and I think with the frame it’s just overwhelming. A gold frame and a blue painting—blue sky, blue ocean and this horseman leaping out. And on the neck of the horse, the like forms, the shape of an angel which then recurs through the sky. To see it is to behold the spectacle of Santiago on his horse, almost leaping off the canvass. So it’s a surprising painting, it’s a big painting, a great painting and it’s here only until October. CVBeat: What would you tell someone who’s already been to the museum in order to convince them to check this new painting out? Hank Hine: Well, we always have something new at the Dali museum. Right now, we’ll have this summer this painting of Santiago. Immediately, we have 13 paintings from the National Contemporary Art Museum in Spain by Dali. That museum’s called The Reina Sofia and we borrowed 13 of their paintings, which are on view and that’s also for a few months more. If you think you’ve seen it, you’re going to see more. Sure, Google is the #1 search engine. But #2 might surprise you. Find out what it is (hint: not Yahoo!) and how that answer could directly influence your customers to book online. Watching a web video (even one on YouTube, the second-most popular search engine) could be the reason travelers stay at your hotel. According to a Google/Ipsos 2012 travel report, online video content is gaining momentum. The report states the use of online video content is particularly important during a traveler’s decision-making process. In all, 21% of leisure travelers and 26% of business travelers rely on videos to book a trip. And almost all of them booked their trips as soon as they finished watching a video related to their search. The report found that travelers watch a mix of user-generated content and professionally-made videos, confirming the importance of tapping into social platforms like YouTube or Vimeo. 62% Videos from hotels, airlines, cruises, tours, etc. 58% Trip reviews from experts. 58% Videos from travel-related channels. 56% Trip reviews from regular people. 48% Videos made by regular people. The same report detailed that 38% of leisure travelers and 57% of business travelers preferred a mobile device against a desktop to access travel information. Those numbers rose by 8% and 25%, respectively, since 2009, indicating a long-term growth trend. “The biggest misconception marketers have is that mobile devices are only used by people who are already in market,” said Miles Media Vice President Nate Huff, who works with Visit St. Pete/Clearwater’s web team. Huff emphasized that the latest State of the American Traveler study showed that, among those who use mobile devices for travel planning, 69% do before they visit a destination, compared to 73% who use a mobile device in the destination. “That means marketers need to be approaching mobile marketing with both ‘inspire’ and ‘inform’ strategies,” Huff said. But don’t think any presence is better than none. The research showed that an unfriendly user experience on a mobile site will drive customers away. Considering mobile devices are on track to capture nearly one in five travel dollars—a total of $25.8 billion in U.S. mobile travel bookings—establishing a productive mobile site is vital. 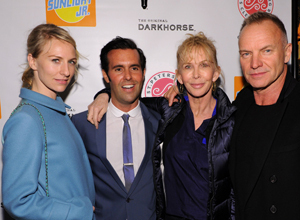 Actor-musician Sting and his wife, Trudie, (pictured right) were among the stars at the St. Pete/Clearwater Film Commission’s reception at NYC’s Tribeca Film Festival last weekend to promote the premiere of Sunlight Jr. The independent film, which was shot and produced entirely in St. Pete/Clearwater, stars Oscar-nominated Naomi Watts (pictured left) and Golden Globe-nominee Matt Dillon. 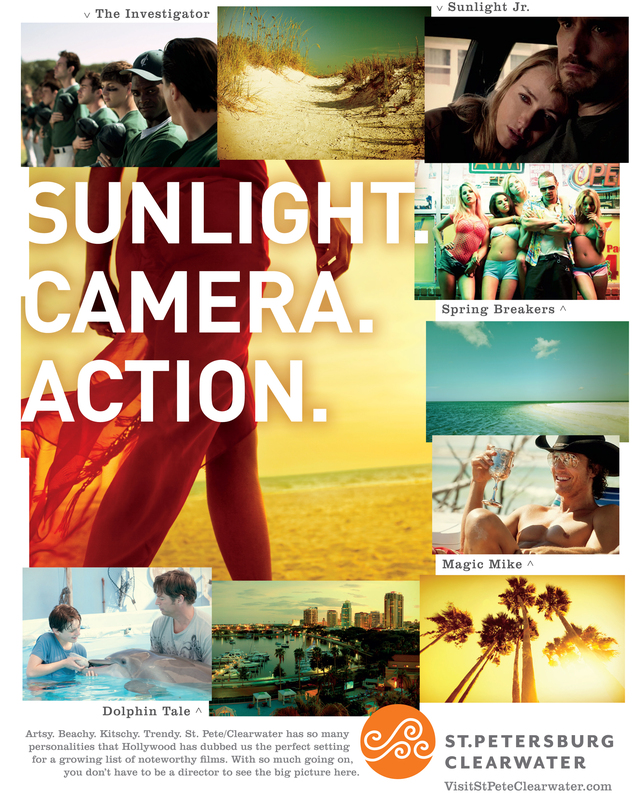 Sunlight Jr. is the latest on the growing list of recent films shot and produced in St. Pete/Clearwater, including the box-office hits Dolphin Tale, Magic Mike and Spring Breakers. The combination of timing, messaging and location made the ad a natural for the NYC market. “New York is one of our greatest feeder markets, and it’s also one of the world’s film capitals,” said Mary DeLong, account director for BVK, the tourism bureau’s advertising agency of record. “So to have the Tribeca Film Festival taking place at the conclusion of our months-long wintertime marketing campaign made the movie-theme tie-in to the area even stronger,” she said. Plus, in NYC and elsewhere, there’s often a certain “cool factor” that plays into the decision making process when visitors decide where to vacation. Recently, Downing hosted a UK journalist who was impressed with the beaches, but was “blown away” by the fact that Magic Mike was shot here. But the greatest and most immediate effect of movie tourism comes when people visit specifically because they saw something in a movie. And no movie has a greater power on that level than Dolphin Tale. The Warner Bros. hit, which premiered in 2011, brought a huge spike in visitors to the Clearwater Marine Aquarium at the time, and has provided a steady growth in attendance as the movie airs in other outlets, such as in-flight videos and on premium cable channels. On a recent sunny day Rita Smith , who drove from out-of-state to visit Clearwater Marine Aquarium, confirmed that fact first hand. “We could have gone anywhere,” she said as she stood in line with her excited grandchildren to buy tickets to the attraction. “But we chose this area just so the grandchildren could meet ‘Winter’. They saw the movie and they just fell in love with her,” she added. Bottom line: Movies are bringing more than famous actors to St. Pete/Clearwater.